According to the report, the investments required to secure land rights for indigenous communities would be modest, but could generate billions of dollars in returns economically, environmentally, and socially — a boon not just for local communities but the global climate, as well. 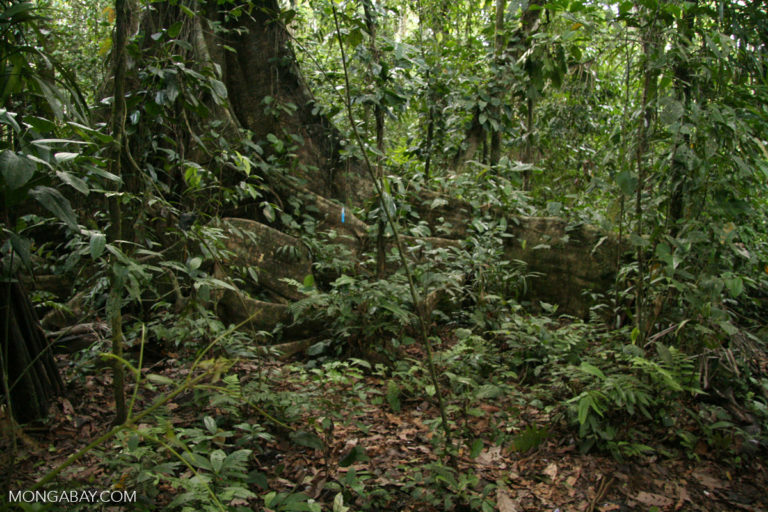 According to the report, between 2000 and 2012 the annual deforestation rates in tenure-secure indigenous forests were significantly lower than outside those areas. “The estimated economic benefits for a 20-year period are: $54–119 billion for Bolivia; $523–1,165 billion for Brazil; and $123–277 billion for Colombia,” the report states. Indigenous leaders from Africa, Asia, and Latin America attended the UN climate talks in Paris last December to present research showing that traditional indigenous territories in the Amazon Basin, the Democratic Republic of Congo (DRC), Indonesia, and the Mesoamerican region comprise more than 20 percent of the carbon stored aboveground in Earth’s tropical forests. It has indeed been shown that securing legal forest rights for indigenous peoples and other local communities not only leads to less deforestation and carbon emissions but can actually improve forests’ ability to store carbon. Less research has been devoted to the costs of securing and maintaining tenure for indigenous forestlands and how they stack up against the benefits, however. But now a new report by the World Resources Institute (WRI) quantifies the economic value of securing land rights for the communities who live in and protect the Amazon rainforest for the first time. 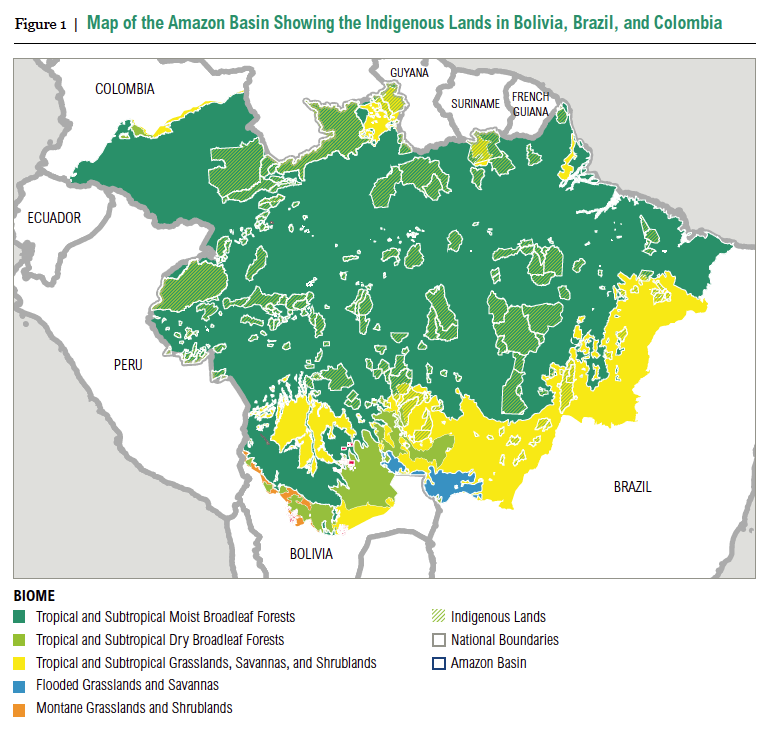 The report focuses on Colombia, Brazil, and Bolivia, countries that contain a significant area of the Amazon rainforest and whose governments have formally recognized many indigenous peoples’ lands. It is meant to build on WRI’s previous cost-benefit analysis of community forest tenure in indigenous territories in the Brazilian Amazon and community forest concessions in the Maya Biosphere Reserve in Guatemala. According to the report, between 2000 and 2012 the annual deforestation rates in tenure-secure indigenous forests were significantly lower than outside those areas: in Bolivia they were 2.8 times lower, in Brazil 2.5 times lower, and in Colombia two times lower. WRI’s cost-benefit analysis found that securing indigenous forestland tenure is a low-cost investment with big benefits. “The estimated economic benefits for a 20-year period are: $54–119 billion for Bolivia; $523–1,165 billion for Brazil; and $123–277 billion for Colombia,” the report states. That means that the costs amount to, at most, one percent of the total benefits, WRI notes. 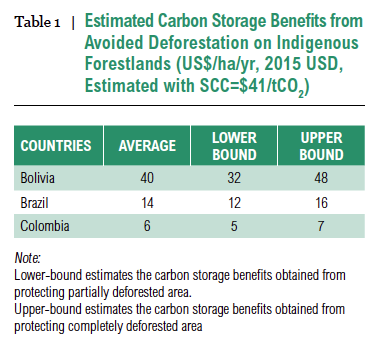 “From a financial perspective, investing in securing indigenous forestland tenure is also a relatively cost-effective measure for climate change mitigation when compared with other carbon capture and storage measures — the costs of securing tenure are 5 to 29 times lower than the estimated costs for coal-fired power plants and 7 to 42 times lower than for natural gas-fired power plants,” per the report. Of course, not all of the benefits can be measured in dollars — or at least, not directly. Forests are a primary source of livelihoods and nutrition for indigenous peoples and other communities around the globe, from Africa and Asia to Latin America and elsewhere. 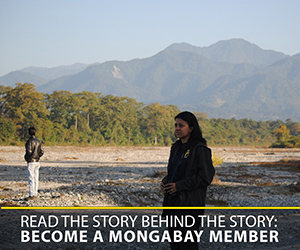 The socio-economic benefits of indigenous and community lands include job creation, community reinvestment in health and education programs, and reduced conflict. “For many communities, they are historically, culturally, and spiritually significant, providing security, status, social identity, and a basis for political relations,” as WRI points out in the report. Then there are the environmental benefits: Indigenous and community forests provide a variety of ecosystem services in addition to carbon sequestration, including regulation of hydrological patterns, nutrient retention, and pollination. WRI found that the forests to which communities have some legal rights, which the group says comprises about one-eighth of the world’s total, contain approximately 37.7 billion metric tons of carbon — 29 times more carbon than is emitted by all passenger vehicles on Earth. “These findings make a strong economic case for governments, climate change funding agencies, and other partners to invest in securing indigenous forestland tenure in Latin America, and, more broadly, community land rights around the world,” the authors of the WRI report conclude. They make a number of recommendations, such as establishing land laws that protect community land rights, removing administrative and other hurdles that stifle the registration and formal recognition of community land, making tenure-secure community forests a central climate change mitigation strategy, and utilizing international climate and development funds to help document and protect community land rights. “Securing indigenous and community forestlands tenure is a low-cost solution that can help governments achieve the climate goals in their Nationally Determined Contributions (NDCs),” the authors write, referencing the nation-specific climate action plans each country submitted to the UN ahead of the Paris climate talks. Buttress roots of a rainforest tree in Peru. Photo by Rhett Butler.